VILLANOVA, Pa. (AP) Jay Wright had a couple of planners in his office and blueprints on the big screen that brought to life some of the striking renovations underway across the street at Villanova’s on-campus arena. The roughly $60 million project is set to transform the Pavilion from a multi-purpose and painfully outdated gym into a state-of-the-art complex with all the high definition scoreboards, suites and modern amenities needed to stay relevant with the other elite programs. Wright gives his input when needed, but Nova’s coach mostly leaves the redecorating to the pros. The arena is gutted and just the shell remains of a gym where the Wildcats blossomed into a national power – and a national champion – under Wright. But the architect of a program that again is expected to sit inside the top 10 of the preseason AP Top 25 poll and romp in the Big East is curious how the Wildcats will fare in a season on the road. 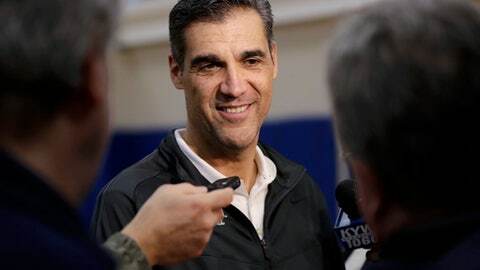 Villanova will play home games about 20 miles away at the Wells Fargo Center, home of the NBA’s Philadelphia’s 76ers. The Wildcats can stuff 20,000 fans inside the arena for a Saturday game against Georgetown, but those around the program wonder how many will turn out for Nicholls State on a Wednesday night in November. The 6,500 fans that sold out the Pavilion, which opened in 1986, won’t make a dent in Philly. Yes, this is the state of the Villanova program under Wright: Can the Wildcats draw 15,000-plus for a so-so game at the Wells Fargo Center is what counts as a concern this season. The Wildcats were picked to win their fifth straight regular-season conference title, guard Jalen Brunson was chosen as the conference’s preseason player of the year, and Omari Spellman was selected freshman of the year. Mikal Bridges might be the most NBA-ready Wildcat, and Donte DiVincenzo and Phil Booth are ready to assume to larger roles following the loss of three seniors that keyed the team’s run to the 2016 national championship. The Wildcats have no seniors of note on the roster – but could lose juniors Brunson, Booth and Bridges to the NBA in 2018. The Wildcats added Collin Gillespie, Dhamir Cosby-Roundtree and Jermaine Samuels as freshmen that fit the mold of top – yet not true blue chip – prospects that will likely stick around four years, graduate and develop into pro-ready players. Wright said Villanova had to remain true to its recruiting principles even as it was riding a high off a national title. A few more things to look for from Villanova in 2017-18: The Wildcats (32-4) saw their chance at becoming the first repeat champions since Florida in 2007 evaporate when they were upset by eighth-seeded Wisconsin. Booth scored 20 points and was the leading scorer in the national championship game against North Carolina. Booth, a 6-foot-3, 190-pound junior guard, missed all of last season with an injured knee and is back and ready to return to form. Spellman, a 6-foot-8 highly recruited forward, was expected to become Villanova’s big man in the frontcourt last season. The NCAA declared the freshman academically ineligible for the season because Spellman did not complete his initial eligibility requirements in time. Spellman is ready to dominate as is the inside presence for a team that traditionally is built around guards. ”I learned a lot about how serious the game is. You can’t take plays off and you can’t be foolish on the court,” Spellman said. Brunson, the sensational point guard, averaged 14.7 points, shot 54 percent from the field, had 148 assists and flirted with the idea of leaving for the NBA.